The GOP has launched a war on women. The more hyperbolic among them will claim it's a war on murder; the less incendiary will assert it's a war on abortion; the politic will say there is no war at all—just people of good faith fighting for their pro-life principles. But the shade of the spin does not matter. The truth is that the GOP has launched an all-out war on reproductive rights and abortion access, which is a direct assault on women's agency, bodily autonomy, basic legal rights, and very personhood. Women are the primary target, but, as in any war, there is vast collateral damage: Trans men who can get pregnant and might need access to abortion services; poor men, young men, uninsured men, marginalized men who seek healthcare at clinics like Planned Parenthood that the GOP endeavors to defund and drive out of business. — According to the Planned Parenthood of Indiana website, "all Medicaid patients will need to pay for their own care or access other funding to be seen at Planned Parenthood of Indiana health centers." — According to the Indianapolis Star, Planned Parenthood of Indiana has been forced to lay off two sexually transmitted disease prevention specialists, and had to close each of its health centers for one day on June 22. —Also from the Star, "A total of 85,000 Hoosiers receive services at Planned Parenthood of Indiana's 28 health centers. If the law is allowed to stand, Planned Parenthood will have to close eight centers that serve low-income patients at two Indianapolis locations, as well as in Bedford, Hammond, Michigan City, New Albany, Terre Haute and Muncie." These diminishing services disproportionately impact women and men who can ill afford it--the poor and marginalized. Last year, the organization performed more than 26,000 pap tests, nearly 30,000 breast exams for clients, more than 50 percent of whom were at or below the poverty level. We know how dire this situation is. We know, because there is no other organization in our state dedicated to Planned Parenthood of Indiana's mission: "To provide comprehensive reproductive health care—confidentially, compassionately, affordably; to protect through prevention—educating honestly and accurately; to support those who need us most—without bias or judgment, without fear, without fail; to ensure that the doors of opportunity remain open for those we serve and their families." We know the truth about Planned Parenthood. We know how important this organization is in the lives of the people it serves. We are those people. We have stories. On Thursday, July 7, we will share them. Please join What Tami Said and Shakesville for "My Planned Parenthood," a blog carnival devoted to sharing the stories of the women and men helped by Planned Parenthood of Indiana and other Planned Parenthood branches. Share your personal story of being helped by Planned Parenthood of Indiana or Planned Parenthood in another state. Link your story to why it is important that the organization continue to thrive. We are particularly interested in the stories of Indiana residents, but welcome other bloggers to take part. Planned Parenthood is under attack in states throughout the country, including Kansas, North Carolina, Wisconsin, and Texas. We need to hear ALL voices. All posts should be scheduled to publish by 9 a.m. Eastern, Thursday, July 7. — Email whattamisaid@gmail.com or melissa.mcewan@hotmail.com with your intention to participate. Include the name of your blog and its URL. — Write your post. We may ask you to include a .jpg carnival graphic with information on how to support Planned Parenthood in your post. — Schedule your post to publish by 9 a.m. Eastern, Thursday, July 7. If you can, send a direct link to your post to one of the email addresses above before July 7. What Tami Said and Shakesville will publish the names and links to all participating blogs in a stub post on July 7. — Continue to spread the word and direct people to blog carnival posts. If you are not a blogger, but would like to share your story, send it to one of the emails above and we will publish it on our websites. (Material published on our blogs is subject to our editorial approval.) Be sure to include your home state and a "handle" that needn't be your real name. We will NOT link to any anti-choice or anti-Planned Parenthood posts. We will verify content at links. 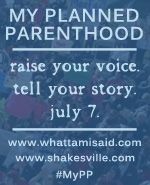 Neither What Tami Said nor Shakesville are affiliated with Planned Parenthood or Planned Parenthood of Indiana. Planned Parenthood is not involved in this effort. Melissa and I are simply two Hoosier women concerned by conservative legislatures' attacks on women and the organizations that serve them, as well as continued distortions about Planned Parenthood's services disseminated by opponents of reproductive freedom and choice. We hope you will join us in our stand. If you or a loved one has ever used Planned Parenthood's services, please donate to Planned Parenthood of Indiana, or a Planned Parenthood in your state today.